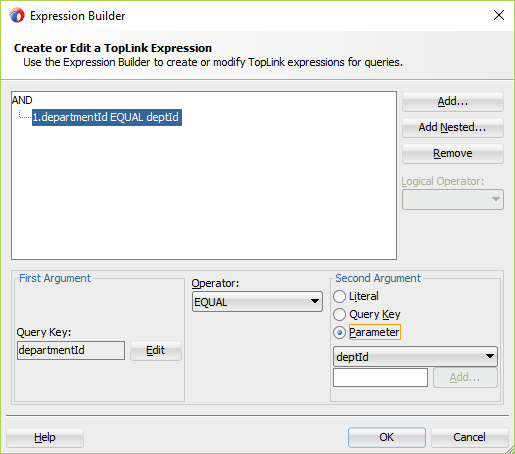 In the previous blog, we have explained, how to create simple REST service without DB adapter. 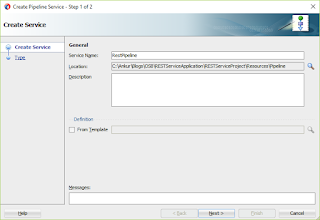 Please follow the blog to get the basic understanding of how to create simple REST service. 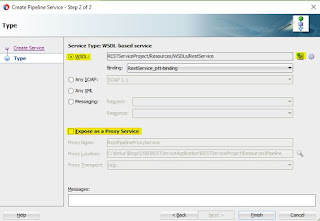 In this blog, we will extend the blog further and be going to explain how to create REST service with DB adapter and provide the response in XML/JSON both. 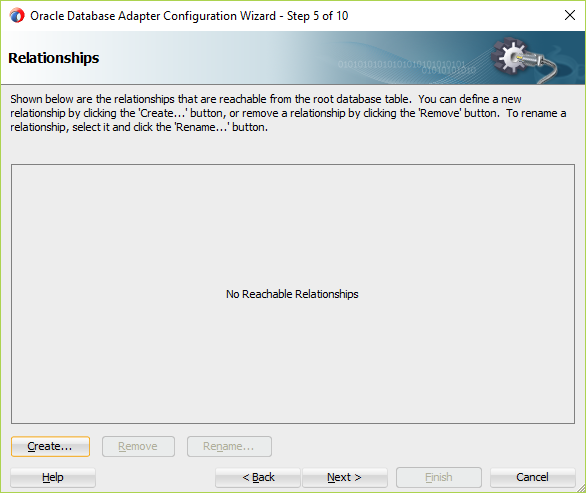 You must have JDeveloper 12.1.3 and Oracle database 11g installed on your machine to complete this example. 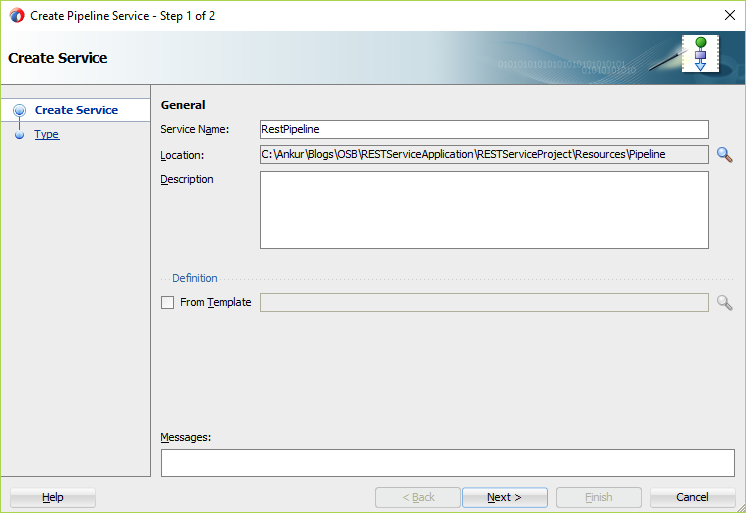 Create the Service Bus application with Service Bus Project. Create the folder structure like below. We have create a folder as per the standard. 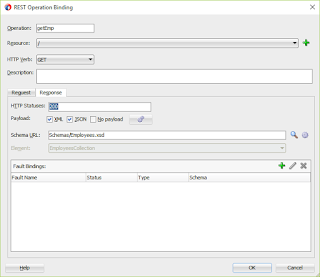 Enter the JNDI (eis/DB/hrds) name that you have created in the WebLogic console and select Connection. Follow the blog for datasoruce and JNDI creation. Click Next, select Perform an operation on a Table Radio button and click Select checkbox only. 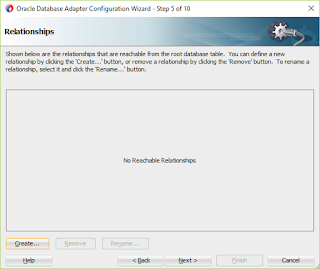 In this blog, we have taken this option, as we want to select data from the table. However, we can opt different operation as per the requirement. Now click Edit button. A dialog will get open, click on Add button, click on Edit button from First argument section and select departmentId field. Click Next three times and Finish. Now Move the the wsdl to WSDLS folder, jca file to JCA folder, xml file to XMLs folder, xsd files to Schemas folder. If the response comes with matching department id you entered, it means Business Service is OK and we are ready with our DB adapter(Business Service). We are ready with REST adapter. Move the wsdls and proxy files into WSDLS and Proxy folders respectively. Let's proceed further with Pipeline. 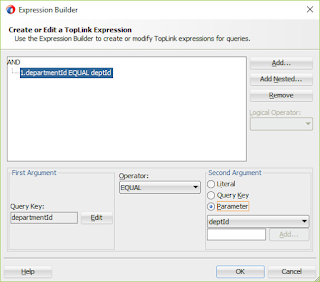 Now create XSLT transformation to transform the business service output. 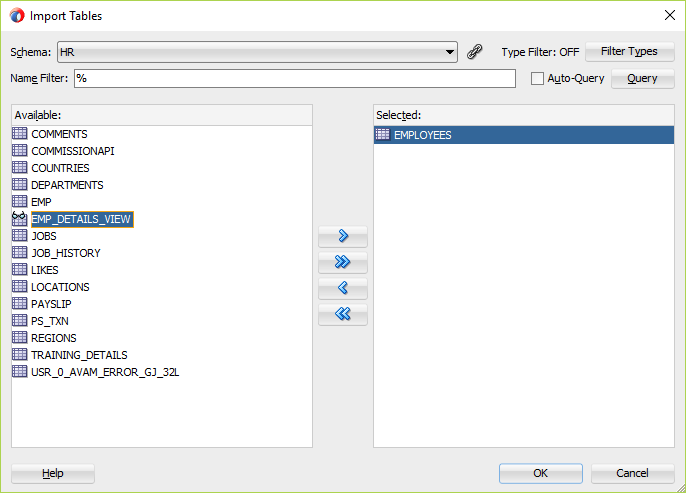 Enter file name EMP.xml, Select Browse button from Primary source section, Select Browse, Choose DBReference_table.xsd and select EmployeesCollection element. Click OK twice. Select Browse button from Target section. 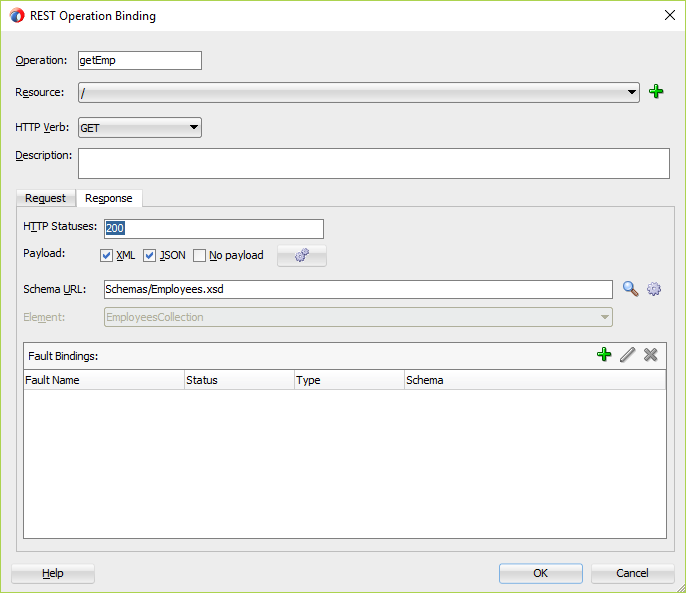 Select Browse, Choose Employees.xsd and select EmployeesCollection element. Click OK twice. If you want to call any external service, OSB gives you the Service Callout component to call business service we created. 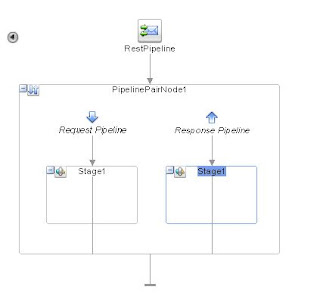 Enter variable name(serviceInput ) in Request payload and variable name in Response(serviceOutput ) payload. serviceInput variable will be used to assign the request payload and whatever business service response will come will be assigned in the serviceOutput variable. Let's see how these variable will be used in the below steps. We can see the response in the XML format. If you want the response in json, go back, select application/json from the Accept drop down and click Execute. im still don't get your point, would you like show me step by step? thank you very much, GBU! I mean to say, we have configured Service callout to call business service, now we want to assign input to the service. So we have one activity called Assign that needs to drop under Service Callout activity. This assign activity will ask two variables one would be input and other would be output. So i kept the name input variable as serviceInput and assigned the input payload required by service callout. Please download the OSB project and see how it has been configured. btw how can i get value like below this without "run dbadapter"? cause my local (laptop) for weblogic get some trouble. And expand the body -> request parameter and assign the value. i've lot of questions. may i know your private email? Please send all your queries you have..
select * from student where id = xid. btw, first i created BPEL and it's work fine and give return value. Could you please help? what might be he cause of the issue?